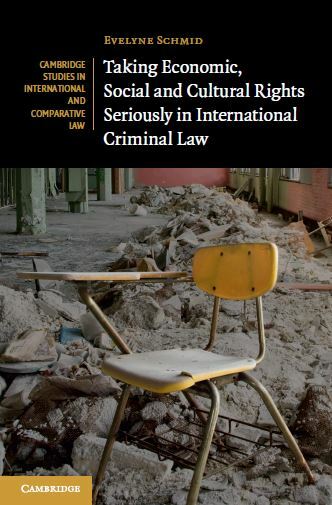 Evelyne Schmid, Taking Economic, Social and Cultural Rights Seriously in International Criminal Law, Cambridge Studies in International and Comparative Law, 2015. At least sin ce Amartya Sen’s economic research, it is well-known that many of ‘those who fall victim to adverse human agency are not injured by proximate violence but as a result of being compelled to live in subhuman conditions’. To address this fact, scholars and practitioners have been debating whether the mechanisms commonly used to address legacies of widespread abuse could engage with economic, social and cultural abuses. Should they be encouraged to do so? And can international law(yers) be of any help in this regard? In 2006, Louise Arbour, then UN High Commissioner for Human Rights, delivered an important lecture and asserted that efforts to address the legacy of widespread human rights abuses display a bias towards civil and political rights. She criticised the way these efforts exclude considerations of economic, social and cultural rights and are ‘predicated on accountability for a small set of past abuses of civil and political rights as a way to achieve peace and the rule of law’. Almost ten years later, the debate on questions of economic, social (and sometimes cultural) dimensions of what is often referred to as ‘transitional justice’ has clearly grown in size and in contestation (as outlined here with Aoife Nolan). Underlying much of the debate is a belief that our conceptual and normative frameworks would need to be expanded in order to address abuses in the realm of people’s social, economic or cultural well-being. The expectation is widespread that dealing with economic, cultural or social issues in processes aimed at addressing a legacy of past abuses is a departure from the original conceptions of transitional justice. Yet, some early documents seem to indicate that abuses of socio-economic and cultural rights have always been part and parcel of the thinking on genocide. For Raphaël Lemkin, the driving force behind the Genocide Convention, the relationship between abusive socio-economic and cultural policies and the definition of genocide seems to have been primordial to the term he coined. ‘Taking Economic, Social and Cultural Rights Seriously in International Criminal Law’ tests one aspect of the broader hypothesis that we do not necessarily have to expand our normative frameworks in order to pay more attention to economic, social and cultural rights in the context of attempts to address past abuses. The book shows that the same factual situation can sometimes simultaneously be described as a violation of an economic, social or cultural right and as an international crime. I argue that international crimes overlapping with violations of economic, social and cultural rights deserve to be taken seriously, for much the same reasons as other international crimes. This argument has important implications not just for lawyers at criminal tribunals, but also for those working for (or with) truth commissions and other commissions of inquiry, reparations programmes, NGOs, human rights institutions or reporters. The argument that violations of economic, social and cultural rights can overlap with definitions of international crimes is, of course, not without important limitations and there is a risk of raising unrealistic expectations. Many, if not most, deserving claims related to economic, social and cultural rights violations do not constitute international crimes. And even when they (arguably) do, all the well-known limitations of international criminal law apply – but they do so whether or not the underlying conduct relates to economic, political, social, cultural or civil rights abuses. As Theodor Meron wrote, ‘international criminal law, of course, is just one element in the life of the society. Addressed in isolation, it will not eliminate abuses’. Yet, despite the limitations of relying on international criminal law, there are crucial ‘expressive’ benefits of engaging more consciously with the thorny questions of what abuses deserve what kind of attention. Where it seems appropriate in a specific context, paying attention to socio-economic and cultural rights violations in the context of international and criminal law recognises that abuses pertaining to people’s access to food, shelter or health-care often result from adverse human agency, rather than from exogenous environmental circumstances. To date, the analysis of economic, social and cultural rights violations and international criminal law is confined to a handful of journal articles and reports. This is striking, since there is an enormous body of literature both on international criminal law as well as on economic, social and cultural rights. The absence of a comprehensive treatment of the relationship between economic, social and cultural rights violations and international criminal law is even more astounding in light of growing interest in socio-economic and cultural issues from the ‘transitional justice’ community which has, for the better or the worse, long relied on international criminal law as a principal normative framework. Reblogged this on The Development Book Club.